I've nearly finished the back for a new cardigan. This pattern is very straightforward, hardly any shaping, so I'm hoping I won't have any nasty last minute surprises like with my grey cardigan. I'm using Cheval Blanc yarn and the pattern is found in the Saturday Afternoon booklet by Classic Elite Yarns. 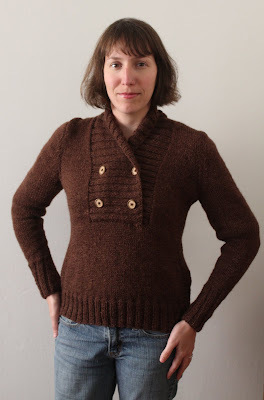 It's the Renaissance Basket Stitch Cardigan designed by Kathy Zimmerman - the red sweater in the photograph. I really love the back of that green sweater next to it, but the front is terribly boring. If it's not doing the model any favors, I'm sure not going to attempt it. Other than that, I recently started an art project. It looks like a giant mess still, but here's where I am with it. You might recognize some of the fabric from my various projects. I'll explain what it's supposed to be when I'm further along! And finally, my sewing class has started back up again so I'll be picking back up with my wool jacket. Other jacket patterns have been tempting me, but I need to finish this one first. In short, I need to get it together and finish up some stuff! Oh, loving the look of that sweater! Can't wait to see how it turns out! Oh, how very exciting with the art project, can´t wait to see what it turnes in to! Hope you´ll be happy with the sweater, it looks terrific, I love the stitch in the design. Very pretty!